Along with computing (operating systems, programming languages, graphics editing), economics, history (ancient Japan and classical Europe in particular), jazz and coffee, another interest I've had since I was a kid is commercial aviation. I guess the logical reason for that would be that given we lived in so many places before I even became a teenager, I had flown in my fair share of aeroplanes. Actually, then again… since when are hobbies logical!? Glancing up at my official post count on this beautiful warm Saturday afternoon at the Boatdeck Cafe coffee shop in Mawson Lakes with a lake coincidently just outside the window, I noticed I just past post 880. If you're a commercial aviation enthusiast too, you'll know where this post is headed! Get it… headed? Where this post is headed? Oh come on, that was a quality joke. Yes people, I just passed the post with the same number as the Convair 880. From what I can remember, the Convair 880 was an early generation jet airliner that was introduced around the same time as the Boeing 707 and the Douglas DC-8. The origin of its name, and its primary selling point, was its above average 880 feet per second speed which was achieved by using engines adapted from military aircraft. While it seated less people than either the 707 or the DC-8, it was viewed by pilots as being more nimble and easier to handle especially in rough weather. Unfortunately the niche market for the type was much smaller than Convair anticipated and was largely viewed as a commercial failure. This despite Convair's later build option for extra revenue generating seating in the form of bolted on deck chairs on the wings which were later deemed a safety hazard. Seems snorkels don't really deliver as much oxygen at several thousand metres above sea level as they do in a pool. One of the distinctive features of the 880 from an observers perspective were it's water injected engines that noticeably smoked up on takeoff and during the initial few minutes of flight. One can imagine looking at pictures of them in action how loud (and expensive!) these birds must have been! Just looking up the Wikipedia article on the 880 it looks as though I got my facts right; sometimes I surprise even myself. According to Wikipedia the primary customers of the 880 were Alaska, Cathay Pacific, Delta, Japan, KLM, Northeast, Swissair, TWA and VIASA. 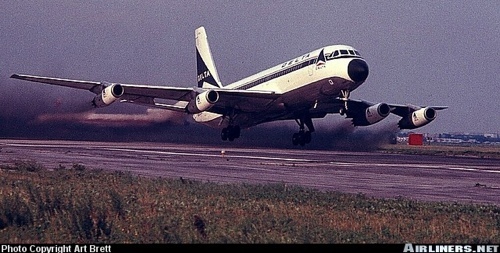 As usual, Airliners.net has the best archive of Convair 880 photos online. Newer post ← If you like my writing, you can buy me a coffee!